Because learning is most engaging when students experience it in the real world, the fifth graders took advantage of applications to issues in their lives during a study of research-based argument essay writing. During the fall, fifth graders examined Initiative 1634, the “Sugar Tax” to learn to investigate and understand an argument, use evidence to build arguments, and use quotations to bolster their arguments. They researched the pros and cons of the initiative through reading political flyers and viewing commercials and news segments. This research was simultaneous with their learning about a citizen’s rights and responsibilities of voting, and visits to our school by Representative Kilduff and Senator O’Ban during the election cycle. After the election, students continued to practice their research and argument skills through an even more personally relevant topic, CWA’s plans for a new Lower School playground. 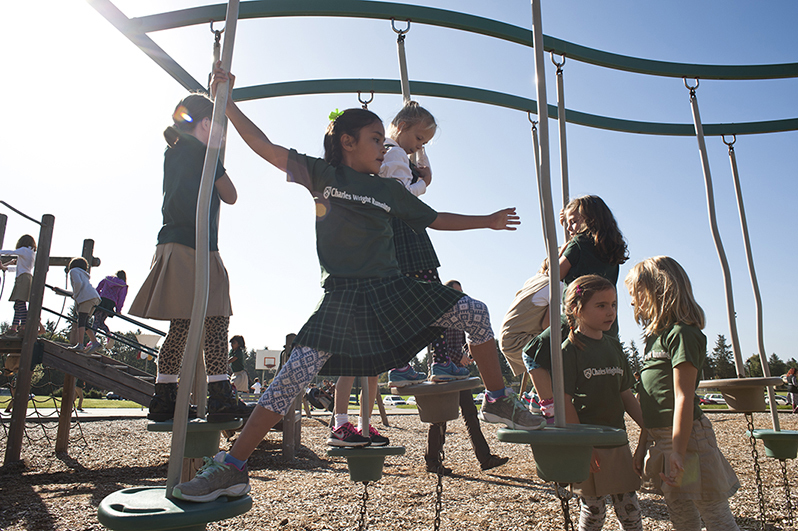 To support this project, fifth graders researched playground equipment in several ways. They analyzed use of the current playground by collecting data about the number of people engaging with each piece of playground equipment and the amount of time it was in use during Lower School recesses. They conducted empathy interviews with first through fifth graders to develop an understanding of what primary users feel is important about the playground, and discovered that collaborative play and physical and mental challenge were high on the list. Finally, fifth graders took a field trip to play on the playgrounds at Titlow and Chambers Bay Parks. Additionally, students researched through reading articles about play and developmental requirements of children and meeting with Mr. Zosel-Johnson to learn about the school’s needs and restrictions. At the same time, they learned in the classroom how to elevate arguments by bringing a critical perspective to writing, including rebuttals and counterclaims, and appealing to their audience. By the end of the process, fifth graders had the evidence they needed to write a research-based argument essay to the Playground Committee to recommend a particular piece of playground equipment!